I have been a fan of Fumi Yoshinaga’s manga for quite some time now, so I was very happy when her series What Did You Eat Yesterday? was licensed for release in English. Although I’ve enjoyed all of Yoshinaga’s translated work, I was particularly interested in What Did You Eat Yesterday? because it promised and has since proved to be a manga realistically portraying the lives of two gay men (and boyfriends) living together in Japan. As can be safely assumed from the title of the series, What Did You Eat Yesterday? 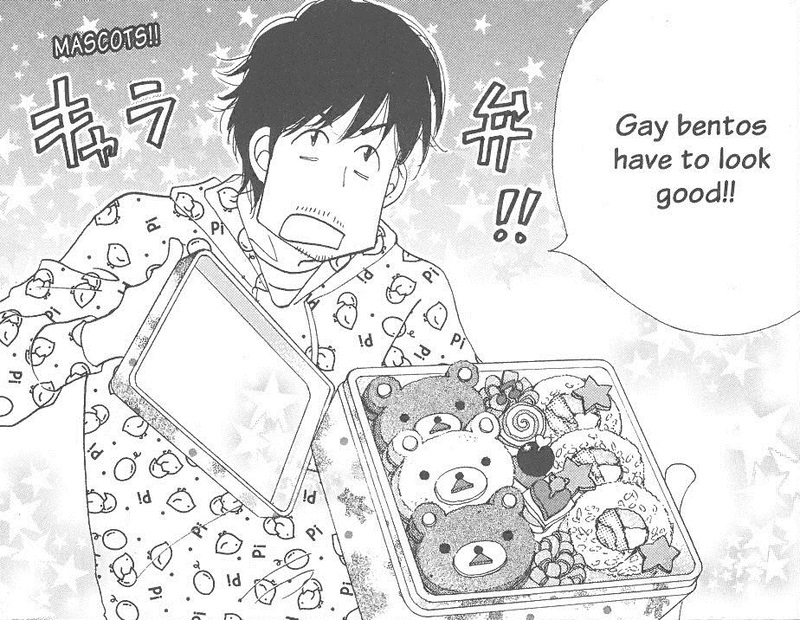 also happens to be a food manga, which is another niche genre that I especially enjoy. Unsurprisingly, with its well-developed characters a touches of humor, I find the series immensely appealing. What Did You Eat Yesterday?, Volume 8 was originally released in Japan in 2013 while Vertical published the English-language edition of the manga in 2015. As a lawyer, Shiro often finds himself involved in sorting out other people’s relationships, helping to resolve child custody disputes and providing divorce consultations and such. In many ways, this allows him to better appreciate his relationship with his boyfriend Kenji. Shiro isn’t always the most outwardly or physically demonstrative with his affection, especially when in public or when compared to Kenji’s exuberance, but the two men have built a comfortable life together. Their relationship has its ups and downs, just like any other couple might encounter, though being gay in contemporary Japan still has its own particular challenges. While Kenji’s family is largely supportive, Shiro’s parents are still adjusting to the fact that their son is in committed relationship with another man and has been for years. Thankfully, both Kenji and Shiro have close friends and acquaintances who have no problems whatsoever with the two of them being together. While Shiro and Kenji are obviously a couple, What Did You Eat Yesterday?, Volume 8 offers several scenarios in which they’re actually acting as a couple. I honestly enjoyed all of the stories collected in the volume, but two that particularly stood out to me explicitly showed them as boyfriends. The first story featured a trip where the two of them visit Kyoto together for Kenji’s birthday in which Shiro acts more stereotypically romantic and boyfriend-like than he has during the entire rest of the series, stunning Kenji in the process. Granted, the underlying reason for Shiro treating Kenji to such an extravagant vacation is a little heartbreaking when it is revealed. A story taking place a few months later sees Kenji and Shiro baking brownies together to celebrate Valentine’s Day, which is all sorts of sweet and wonderful. That chapter is also an excellent example of how the food and recipes included in What Did You Eat Yesterday? can be directly incorporated into the story itself. Some chapters are more successful at this than others–occasionally the food in the series comes across as being tangential–but I absolutely love when Yoshinaga pulls it off well. The relationships between the characters of What Did You Eat yesterday?, often expressed through the sharing and enjoyment of food, are a crucial part of the series. There are many different types of relationships portrayed, but What Did You Eat Yesterday?, Volume 8 in particular reminded me of the importance of family relations in the manga. Just like in real life, the opinions and actions of family members can have a tremendous impact on an individual. 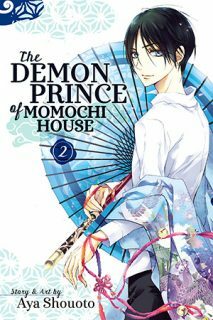 The eighth volume reveals more about Kenji’s family circumstances when he returns home on the occasion of the death of his father. The acceptance shown to him by his mother and his sisters and their children was comforting to see, giving hope that in time Shiro’s parents, too, will be able to more fully accept their son. Family isn’t necessarily limited by law or blood in the series, either–Shiro ends up becoming a godfather of sorts when the daughter of one of his friends has a baby. And, of course, there is the small family made up of Shiro and Kenji themselves. Though they have their disagreements, What Did You Eat Yesterday? makes it clear that they greatly care for each other. Filed Under: REVIEWS Tagged With: fumi yoshinaga, manga, vertical, what did you eat yesterday? What Did You Eat Yesterday? incorporates so many things that I love—the work of Fumi Yoshinaga, food, queer life, and so on—that it’s really not too much of a surprise that I enjoy the manga series. Yoshinaga has had many of her manga released in English. I have always been particularly impressed by the subtle complexities of her characterizations. Her skill at writing people is especially important for a series like What Did You Eat Yesterday? in which a tremendous amount of focus is given to the characters themselves rather than to an intricate, overarching plot, at least when the manga’s not focusing on food. The characters in What Did You Eat Yesterday?, likeable or not, are all very realistically portrayed, which is one of the things that I appreciate most about the series. What Did You Eat Yesterday?, Volume 7 was originally published in Japan in 2012. The English-language edition, released by Vertical, was published in 2015. Shiro and Kenji have been living together for years, but it’s only recently that Shiro has managed to get up the courage to actually introduce his long-term boyfriend to his parents. It’s a momentous albeit awkward occasion, but Kenji at least is thrilled by the prospect. Shiro’s family has known he was gay for quite some time, however they are still coming to terms with exactly what that means. Happily, sharing a good meal can go a long way to help acceptance and understanding grow. Food has helped to improve and stabilize Kenji and Shiro’s relationship as well—Shiro enjoys cooking and Kenji is usually more than happy to accommodate his boyfriend, not to mention eat the fruits of his efforts—which is why when work interferes with their dinner dates at home it’s particularly vexing. The salon that Kenji works at is undergoing renovations and staffing changes while the law office where Shiro is employed is inundated with bankruptcy cases. Both men have been very busy of late, but they are still ready to support each other both inside the kitchen and outside of it. Food, and the preparation and consumption of said food, is a major component of What Did You Eat Yesterday?. A majority of the seventh volume, if not the entire series, is spent either cooking in a kitchen or eating around a table. While other aspects of Yoshinaga’s artwork are rather simple, she puts a tremendous amount of detail into the various dishes that are featured in the manga—the food in What Did You Eat Yesterday? is beautifully illustrated. The recipes in the series tend to be fairly detailed as well. It is entirely possible for an experienced cook to successfully recreate many of the courses. I’ve even been tempted to try a few myself. (The tea sorbet from the seventh volume sounds especially appealing to me.) Occasionally, the focus on food in What Did You Eat Yesterday? can get in the way of the stories being told, but sometimes it’s expertly integrated. As much as I enjoy all of the food and eating What Did You Eat Yesterday? (and I certainly do), what really makes the series work for me are its characters and the realistic portrayal of their lives. I have come to love and care for the characters in the series a great deal in spite of, or maybe because of, their very human flaws. They all come across as real people with both good traits and bad. I enjoy seeing their relationships evolve and change, and I enjoy seeing them continue to grow as people well into their adulthood. The individual chapters of What Did You Eat Yesterday? provide small snapshots of the characters’ everyday lives. Sometimes the events shown are fairly ordinary or mundane, such as grocery shopping followed by a quick stop at a cafe, while others are more momentous, like meeting the parents of an established partner for the first time. But even the seemingly small and quiet moments in What Did You Eat Yesterday? are important, carrying signficant meaning and impact, and showing just how skilled a writer Yoshinaga can be. Fumi Yoshinaga’s series What Did You Eat Yesterday? is a manga that I’m very glad is being released in English. 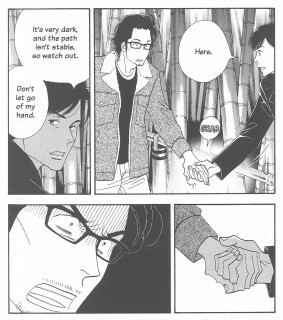 Part slice-of-life manga focusing on contemporary gay relationships, work relationships, and friendships, and part food manga, the series holds a tremendous amount of appeal for me. Plus, it’s created by Yoshinaga whose manga as a whole I tend to enjoy. I particularly appreciate the subtle and nuanced depth that many of her characters exhibit, which is certainly true of the characters found in What Did You Eat Yesterday?. The sixth volume of the series was originally released in Japan in 2012 while the English-language edition was published in 2015 by Vertical. Although this particular volume does have some translation issues—some awkward phrasing as well as questionable word choices (such as “pepper balls” instead of “peppercorns”)—generally Vertical’s release of the series has been great. Although Shiro will soon be turning forty-seven, he still has room to grow and has only recently started to really become comfortable with his sexuality. He and his boyfriend Kenji have been living together for years but its a relationship that he has largely kept private. Shiro’s parents know he’s gay, as do a select handful of close friends, but he hasn’t mentioned it to his colleagues and he’s terrified of being found out by straight strangers. Kenji, on the other hand, is able to be much more relaxed and open about who he is. Happily, Shiro and Kenji have developed a good friendship with another gay couple, Kohinata and Wataru, which has allowed Shiro to become a little less anxiety-ridden in public. He continues to worry about appearances, and he’s still fairly reserved when it comes to outwardly demonstrating his affection, but it has become easier for Shiro to enjoy time spent with Kenji outside of the house, whether it be a major grocery shopping trip or a bento lunch picnic in the park. Although I am a huge fan of food manga in general, and meals and their preparation are certainly a major component of What Did You Eat Yesterday?, what I find most appealing about the series is its characters and their lives. But the manga works best for me when the food and recipes tie directly into the plot and character development instead of being a more tangential element. Some volumes of What Did You Eat Yesterday? bring the characters and food together better than others, but overall the sixth is fairly successful in doing that. High-quality ingredients are given as gifts of thanks, meals are prepared as a way to offer comfort and support, recipes are modified when finances are tight, the qualities of a proper bento are debated, and more. Food is obviously important to the characters in the volume. What Did You Eat Yesterday? tends to be fairly episodic, each chapter exploring a small part of Shiro and Kenji’s lives and featuring a recipe detailed enough that an adventurous reader or experienced cook could actually attempt to make the dish. However, recurring characters and continuing story threads do help to tie the series together as a cohesive whole. There may not be a grand, overarching plot to What Did You Eat Yesterday?, but there is still character and story development to be found. Each reappearance of an established character adds more depth to them as a person and reveals more about the complexities of their relationships with other people. Each volume of What Did You Eat Yesterday? explores more about Shiro and Kenji as well as about their families, friends, and coworkers. And with the sixth volume specifically, I’m especially happy to see Shiro becoming gradually more confident and accepting of himself. I have thoroughly been enjoying the English-language release of Fumi Yoshinaga’s manga series What Did You Eat Yesterday?. This probably shouldn’t be too much of a surprise since the series brings together so many of my loves and interests: manga, Fumi Yoshinaga, food, and queer life, just to name a few. 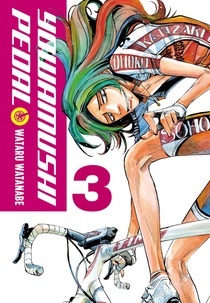 What Did You Eat Yesterday?, Volume 5 was originally published in Japan in 2011 while the English translation of the volume was released by Vertical in 2014. Vertical made many fans of Yoshinaga, myself included, very happy when it licensed What Did You Eat Yesterday?, a somewhat niche title, but a series with the potential to appeal to a variety of audiences. 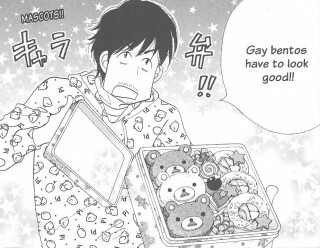 Food and handsome gay men are common themes in many of Yoshinaga’s manga and are frequently even found within the same work, which is certainly the case with What Did You Eat Yesterday?. Though not my favorite Yoshinaga manga, it’s still a great series and one that I enjoy. Food brings people together, sometimes in unanticipated ways. Shiro’s friendship with Kayoko, which started when they decided to split a watermelon that was on sale at the supermarket, has continued to deepen. Though they were once complete strangers, they have now become regular cooking buddies, sharing recipes and food. Her family likes Shiro as well, though at times he’s treated as something of a novelty simply because he’s gay. Kayoko’s husband even makes a point to introduce Shiro to a member of his tennis club, assuming they’ll get along well since Kohinata happens to be gay, too. They actually do, in an odd sort of fashion, and eventually Shiro, Kohinata, and Kenji and Wataru–their respective boyfriends–all end up sharing a meal together. In a roundabout sort of way, it’s thanks to that watermelon that they ever met. Food can help turn acquaintances into friends and can strengthen the existing bonds between family members as traditions are passed along from one person to the next. One of my favorite chapters in What Did You Eat Yesterday?, Volume 5 was actually when Shiro visited his parents for the New Year holiday. For the most part, What Did You Eat Yesterday? is fairly episodic, although there is ongoing character development. However, Shiro returning home for the New Year celebration is a recurring event in the series which has already happened several times in the manga’s earlier volumes. Generally, there’s also some family drama involved with these visits. Shiro’s parents initially struggled when he came out to them, but it’s marvelously touching to see how much more accepting and even supportive they have become of their son’s homosexuality. There is a really wonderful scene with Shiro and his mother cooking together in the fifth volume of What Did You Eat Yesterday?. Sometimes the series’ focus on food feels completely separated from its story, but here it was a perfect combination, the cooking furthering the characters’ personal growth and connections. While the food and recipes are prominent parts of What Did You Eat Yesterday?, not to mention some of the reasons that I enjoy the series, the characters and their relationships are just as important to the manga and are what really make it successful as a work. It makes perfect sense to me since I associate family with food, but family relations are a frequent focus in What Did You Eat Yesterday?, especially those between Shiro and his parents as well as those between Shiro and Kenji as they continue to make a life and home together. The fifth volume also reveals more about Kenji’s past and his own unfortunate family situation. What Did You Eat Yesterday? largely tends to follow Shiro and therefore not as much is known about Kenji, so I particularly appreciate when the story turns towards him for a time. Yoshinaga’s characters in What Did You Eat Yesterday?, are believable flawed and complex individuals with histories and subtle depth, making the series particularly gratifying. 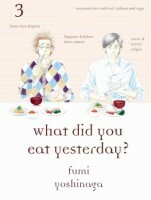 With each new volume of Fumi Yoshinaga’s series What Did You Eat Yesterday? that is released in English, I seem to fall in love with the manga just a little more. What Did You Eat Yesterday? probably isn’t my favorite series by Yoshinaga, but I still enjoy the series immensely. Granted, What Did You Eat Yesterday? has a few things going for it that particularly appeal to me. First of all, I’m already a well-established fan of Yoshinaga’s work in general. I also happen to be a fan of food and food manga which What Did You Eat Yesterday? most definitely is. But perhaps most importantly, I appreciate the series’ realistic portrayal of a devoted gay couple and some of the issues that queer people face in contemporary Japan. Food and gay men are frequently found in Yoshinaga’s manga–often together for that matter–so it’s not a terribly surprising combination to see in What Did You Eat Yesterday?. I’m certainly not going to complain about it, though. The fourth volume of the What Did You Eat Yesterday? was published in Japan in 2010 before being released by Vertical in English in 2014. Although he is a successful and respected lawyer, Shiro much prefers his time spent in the kitchen over his time spent at the office. Cooking has its challenges too though, like when Shiro’s boyfriend Kenji decides that they should have friends over for a dinner party rather than eating out. This solves the problem of Shiro’s constant worrying over being outed as gay while in public, but now he is left to fret over what to serve two men with very discerning palates. (Fortunately, Kenji is more than happy to eat whatever it is Shiro cooks up.) Every once in a while it’s actually Kenji who is set loose in the kitchen. Shiro is more particular when it comes to cooking and preparing meals so he’d much rather be the one in charge, but occasionally that’s just not possible. Kenji might not have the same confidence or natural flair that Shiro has for food, but he can still make a pretty good dish when he needs or wants to. From time to time even Shiro is faced with a technique that he hasn’t quite mastered yet. And so while cooking is often a way for Shiro to unwind, it can sometimes cause a bit of stress, too. As always, food, it’s preparation, and the resulting recipes are all a major part of What Did You Eat Yesterday?. Some readers will find the minute details tedious, especially if they have no inclination or ability to actually try making any of the dishes, but those sections can easily be skimmed over or simply appreciated for Yoshinaga’s artwork. Her illustrations of food and cooking techniques are beautifully drawn and nearly photorealistic in many instances. Yoshinaga is able to convey a wide variety of textures which is especially important, and impressive, as she is working in black and white without the aid of color. But what particularly struck me about the cooking scenes in the fourth volume of What Did You Eat Yesterday? is how Yoshinaga skillfully captures the different moods pervading the kitchen through Shiro and Kenji’s body language and facial expressions: Shiro’s intense preoccupation when trying to put together the perfect meal, his gloom and frustration when something doesn’t turn out quite right, Kenji’s frenetic happiness when he gets a chance to take care of Shiro for a change, and so on. Even though a fair amount of What Did You Eat Yesterday? is spent in the kitchen, Yoshinaga’s focus on the characters is a particularly important component of the manga. The series tends to be episodic from chapter to chapter, but growth and change can still be seen as Kenji and especially Shiro are further developed. The fourth volume of What Did You Eat Yesterday? shows Shiro struggling with his anxieties about still being partially in the closet, admiring and perhaps even envying how open, easygoing, and carefree Kenji is able to be about his sexuality. Kenji and their friends are exceptionally considerate and accommodating of Shiro’s fears, but those fears still understandably cause some tension in his relationships. Another interesting developement in this volume of the series is that both Shiro and Kenji at least temporarily become the confidants of their respective bosses who have a few family issues of their own to work out. While the food in What Did You Eat Yesterday? is appealing, it’s really these sorts of connections and moments between characters that make the series so engaging. 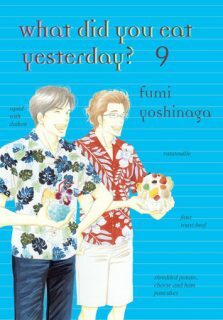 As a fan of Fumi Yoshinaga’s manga, food, and stories with a queer bent to them, I was extraordinarily happy when her series What Did You Eat Yesterday? was licensed for release in English. The third volume of What Did You Eat Yesterday? was originally published in Japan in 2009 while the English-language edition was released by Vertical in 2014. I have been thoroughly enjoying the series so far and its mix of gay slice-of-life and recipes, so I was very much looking forward to reading the third volume. Personally, I like the series best when Yoshinaga focuses on the characters, but I would be lying if I tried to say that I didn’t also like all of the food found in the manga, too. What Did You Eat Yesterday? is most effective when Yoshinaga is able to combine and balance those two major aspects of the series. The ideal balance isn’t always achieved, but even when it isn’t What Did You Eat Yesterday? always has intriguing characters, delicious food, and just the right touch of humor to accompany it all. With his father recovering from an illness, Shiro finds himself spending more time with his family than he has in a long while. Though it’s better than when he first came out to them, his parents are still coming to terms with their son’s homosexuality and their relationship can sometimes be a little strained. Granted, some of that uncomfortableness has very little to do with the fact that Shiro is gay and more to do with the fact that the entire family is made up of people with strong personalities. While Shiro is out to his family and close friends, he’s still closeted at work which, along with his incredible self-consciousness, occasionally gets him into trouble. Things are a little easier for him at home in the kitchen where he can relax and focus on what he really loves: cooking gourmet meals on a tightly kept budget. His boyfriend Kenji, who is much more open about his own sexuality, is always an appreciative audience for Shiro’s meals. It’s a good thing, too. The two of them have been living together for a few years now and food usually helps to smooth over some of the bumps in their relationship. Generally in What Did You Eat Yesterday? the kitchen is Shiro’s domain. Kenji will gladly help out when asked and given direction, acting as a sort of sous-chef, but for the most part it’s all Shiro. However, in the third volume Kenji gets to take the lead for a chapter while Shiro is off visiting his folks for the New Year. He makes instant ramen. (Granted, with a bunch of extra trimmings.) In a delightful twist, it’s treated in the manga as though he’s having an affair. Instant ramen actually happens to be one of my comfort foods, but I’ve only recently begun trying to dress it up a bit. In addition to the food and its preparation being sumptuously drawn, one of the great things about What Did You Eat Yesterday? (at least I think it’s a great thing) is that the recipes included in the stories are detailed enough that they can be followed and produce results. After only three volumes there are already plenty of recipes that I’m interested in attempting from the series. A variation on Kenji’s ramen has been added to that growing list. Food is certainly an important part of What Did You Eat Yesterday?, but so are the characters and their relationships. Family is a particularly prominent theme in the third volume. Shiro is on fairly good terms with his parents, but very little is actually known about Kenji’s family at this point. It’s unlikely that the two of them will have their own kids which will have implications for them later in life, something that is made all the more clear as Shiro deals with his parents as they age. What Did You Eat Yesterday? 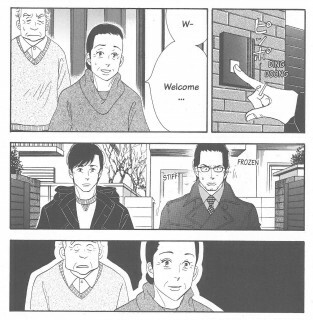 has one of the most realistic portrayals of a devoted, long-term gay couple that I’ve encountered in a manga (or comics in general). Honestly, when it comes right down to it, Kenji and Shiro’s relationship isn’t all that dissimilar from the heterosexual couples in the series, though they do face some particular challenges unique to their situation. Like any pair, they have their disagreements and small spats, but they also care about each other a great deal. Shiro in particular isn’t always the most overtly demonstrative with his affection, but often it’s the little things that really make a relationship work. Fumi Yoshinaga’s series What Did You Eat Yesterday? is a manga which I have been hoping would be released in English for years. Happily, Vertical stepped up and recently began publishing the series. In addition to featuring a fairly realistic portrayal of a gay couple in contemporary Japan (two forty-something men who are living together), What Did You Eat Yesterday? also includes plenty of delicious food. 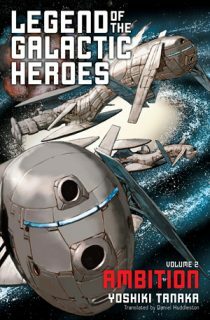 I read and enjoyed the first volume a great deal and so was looking forward to reading the second as soon as I could get it into my hands. What Did You Eat Yesterday, Volume 2 was originally released in Japan in 2008 while Vertical’s English-language edition was published in 2014. The series is currently eight volumes long and is still being serialized, so I’m hoping and expecting to be able to enjoy the manga for some time yet. It makes me extraordinarily pleased to know that Vertical is releasing What Did You Eat Yesterday?. So far, the publisher has done a fine job with it. Shiro Kakei and Kenji Yabuki have been living together for the last three years or so and have known each other for a little while longer than that. It’s an arrangement that works well for them. Shiro happily cooks the meals for the household while Kenji, unlike some of Shiro’s past flames, is more than willing to help out with the chores. Kenji also happens to be an appreciative audience for Shiro’s culinary creations. Shiro has a passion for food and derives great pleasure in preparing delicious meals as frugally as possible. Entire menus can be inspired by a single ingredient that just happens to be on sale at the time and he is very careful not to let anything go to waste. Granted, there seems to be only so many different ways for a person to use celery. But with a little help from his coworkers and friends, not to mention his natural creative talent in the kitchen, Shiro is usually able to figure something out. And generally Kenji doesn’t take too much convincing to happily eat whatever it is Shiro comes up with. There are two major aspects to What Did You Eat Yesterday? : the characters and their lives, and the food itself. I feel the series does best when these two things are working in tangent to tell the stories, but quite frequently the meals and their preparation seem to be separate elements entirely. Shiro has the habit of narrating every step as he is cooking. This means that each chapter includes at least one recipe detailed enough that it could be replicated, but people who more interested in the manga’ stories will likely find it to be tedious. However, those sections can easily be skimmed by readers who don’t care for the cooking minutia without too much being lost from the narrative or plot of What Did You Eat Yesterday?. In general, Yoshinaga’s beautiful illustrations of the food and Shiro’s techniques are more than enough to follow along with what is happening in the kitchen. In some cases, the time spent and the complexities of the recipes are actually used make a point: the extra effort put into a meal imbues it with additional value and meaning for those preparing and eating it. I do love the food in What Did You Eat Yesterday?, but I love the characters and the stories that Yoshinaga is telling even more. In this volume I was particularly delighted to learn how Shiro and Kenji first met and started living together. (One of my favorite moments is Shiro recognizing that Kenji’s not even his “type,” but that he is still incredibly lucky to have him.) I also appreciate how the two of them have important relationships outside of each other. Their friends, families, and coworkers all have their roles to play in the series. A major theme that becomes apparent in the second volume of What Did You Eat Yesterday? is communication. Usually it’s Kenji that needs to be verbally heard; Shiro tends to be more reserved, expressing himself more through his cooking than through words, but he knows when he needs it Kenji will be there to listen to him, too. I’m looking forward to learning more about the series’ characters and their relationships in the next volume of What Did You Eat Yesterday? immensely. I have been a fan of Fumi Yoshinaga and her work for quite some time now. English-language readers have been fortunate in that so many of her manga have been translated. I and many others were very excited when Vertical announced the license of her series What Did You Eat Yesterday?, a series that I have been hoping would be picked up for years. The first volume was one of the manga releases that I was most looking forward to seeing in 2014. What Did You Eat Yesterday?, Volume 1 was originally published in Japan in 2007; I am thrilled that it is now available in English. There were several reasons why I was particularly interested in reading What Did You Eat Yesterday?. It’s by Yoshinaga, from whom I’ve come to expect great stories and complex characters. The series is also a food manga, a niche that I am known to enjoy. (Actually, food often plays an important role in Yoshinaga’s manga.) And I was especially interested in the incorporation of contemporary Japanese gay life in What Did You Eat Yesterday?–the two main characters are boyfriends in their forties who live together. Shiro Kakei is a successful lawyer at a small firm, but his real passion is food. He’s a great cook, and an extremely frugal one, too. Kakei simply enjoys a good meal. The palate of his boyfriend Kenji Yabuki, a flamboyant hairstylist, isn’t nearly as refined as Shiro’s but he certainly appreciates his partner’s creativity in the kitchen. The two of them have been dating for three years, so their relationship is well established, but they still face some challenges. Although both of their families know that they are gay, Shiro prefers to be much more discreet about his homosexuality when dealing with his coworkers and strangers. Kenji, on the other hand, is happy to have a chance to brag about his boyfriend. And just because they’ve been together for so long doesn’t mean that they don’t have to deal with old flames and jealousy. But at least they can always depend on delicious cuisine to help smooth over the bumps in their relationship. The food in What Did You Eat Yesterday?, both the description of the meals and the care that Yoshinaga has put into drawing them, can be mouth-watering. Even the most simple dishes are beautifully portrayed, in part because food is so important to Shiro and he puts time and effort into its preparation, but also because Yoshinaga shares that same passion. There is enough instruction in What Did You Eat Yesterday? that adventurous readers could easily duplicate the featured recipes. However, the food in What Did You Eat Yesterday? works best when it is directly tied into the manga’s plot and story. Occasionally that ideal balance is missing in the first volume. The meals, while lovely, can from time to time feel tangential, almost as if there are two different manga sharing the same series–one focusing on food and one focusing on people. I do enjoy the food and the important role that it plays in What Did You Eat Yesterday?, but in the end I’m even more interested in the characters, their relationships, and their lives. Shiro and Kenji make an intriguing couple. Out of the two of them, Shiro is the least secure with who he is and is very concerned with keeping up appearances. He comes across as very brusque and some find him unlikeable as a result, but it’s a defense mechanism. Kenji seems to be much more comfortable with himself. The two of them aren’t frequently affectionate, at least not overtly so, but they do care about each other. It can be seen in the little things that they do–such as simply offering to carry a heavy bag–and in their more subtle interactions. Shiro often tries to smooth over arguments and hurt feelings the best way he can: through cooking. And that’s one of the things What Did You Eat Yesterday? does best–showing how people connect and communicate through food. What Did You Eat Yesterday? is one of those holy grail manga that I thought would be tough to get here in America in translated form, so you can imagine my delight when Vertical announced that they would be publishing it. No one does slice of life foodie manga like Yoshinaga, so I was looking forward to this series about a gay couple and the food they eat. Shiro Kekei is a lawyer for his day job, determined to take on boring cases that will allow him to leave work by 6 every day. He doesn’t share much about his personal life at work, seeming very aloof. Shiro’s enthusiasm comes out when he’s shopping for and preparing food for his outgoing boyfriend Kenji who works at a salon. Ordinarily reading someone’s thoughts as they scan the supermarket for bargains and contemplate the nuances of the seasoned rice that they are cooking wouldn’t be all that exciting, but Yoshinaga’s wit and humor makes these every day occurrences fascinating. What Did You Eat Yesterday? is all about food, but Yoshinaga also includes details of character interaction that make you want to spend more time with the people she introduces. Shiro’s mother calls him and browbeats him about not being out at work, yelling over the phone “Proclaim it loud and proud! Being homosexual is nothing to be ashamed of!” Shiro zealously guards his privacy, while Kenji brags about his hot lawyer boyfriend at work while he’s cutting hair. Shiro has another close friend outside of work, an older housewife who he bonds with over their shared love of cooking, and they meet in an amusing way. Seeing the contrast between Shiro’s job as a lawyer and the hobby that takes up so much of his interior life is interesting, as well as the way the different personalities Shiro and Kenji complement each other. There are a few recipes in the book, and for the dishes that Shiro prepares that aren’t as fully described, it would be easy to track down a recipe online. I did find myself wondering towards the end of the book if I could start using my rice cooker more creatively. This was a pleasure to read, from the opening scenes to the next volume preview that includes a list of all the foods the reader can expect to see in volume 2. Filed Under: REVIEWS Tagged With: vertical, what did you eat yesterday?